RainSaucer - Store water for free? When we first got into the rainwater harvesting business, our trusted advisor Vishwanath Srikantaiah of India's Rainwater Club told us that cheap water storage is the key to making rainwater collection pervasive. After all, he emphasized, if you cannot store the collected water at a reasonable cost, you run into issues with capital availability especially in developing countries. But even here in the US, we see price sensitivity amongst consumers who are increasingly likely to make their own rain barrel rather than buy one. Or in cities where rain barrels are provided free or subsidized, demand is almost always greater than program supply. - 55 gallon food safe plastic drums- we got ours from a Microbrewery. Other sources include bottling plants and food manufacturers. Just make sure to get one with a 2" NPS fine thread hole if you want to make it a free standing rain collector using our system. - 5 gallon buckets- from local restaurants. Soy Sauce for example is often sold in such containers.Most proprietors are happy to help in the name of recycling. 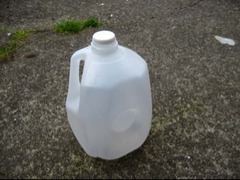 - 1 gallon jugs- like you see every week when you buy milk. A great way to use these is by offloading water from a full rain barrel so that storage is freed up. Then with a few pin holes in the cap you have a watering can.